The City of Christchurch is situated on the old delta of the River Waimakariri, and is divided into two parts by the Avon River, which may be called the North and South. It stands upon an alluvial plain, sloping from the north-west to the south-east. The north portion averages 14 feet and the south 12 feet above high-water mark. The surface of the town was originally intersected and corroded over its whole extent by the channels of the flood waters of the river and other watercourses, and the site of the town in its natural state has discharged its surface waters both into the Avon and Heathcote Rivers. The rapid occupation of the sections and the formation of the streets have combined to interfere with the original channels and the gullies, which heretofore acted as main drains, have been necessarily dammed up so as to prevent the discharge of the waters which found their way I through them. The report goes on to describe the problem of drainage, exacerbated by the low-lying nature of Christchurch relative to the sea, and ways to address it. 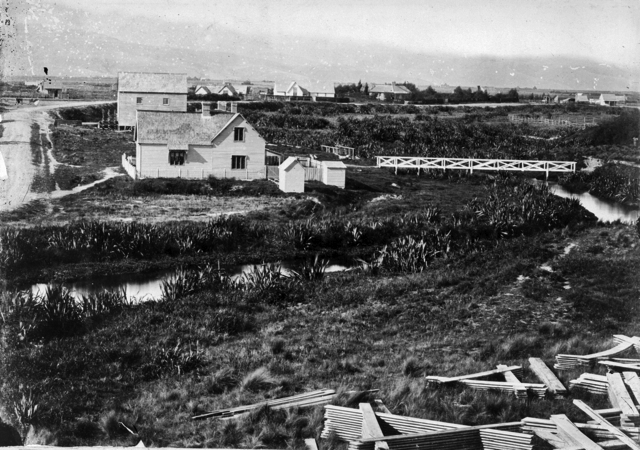 The poorly drained nature of Christchurch was brutally demonstrated only four years later, when it was struck by a disastrous flood, causing death and extensive damage to property and infrastructure. Human beings can be so, so clever ….. and so, so stupid.